This article is about the province of North Korea. For the hypothetical province claimed by the Republic of Korea, see North Pyeongan Province, Republic of Korea. 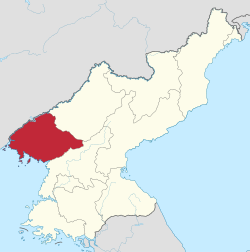 North Pyongan Province (Phyŏnganbukto; Korean pronunciation: [pʰjʌŋ.an.buk̚.t͈o], also spelled North P'yŏngan), written before 1925 in English as Yeng Byen) is a western province of North Korea. 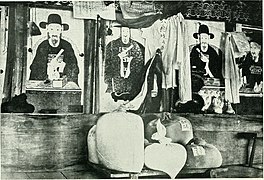 The province was formed in 1896 from the northern half of the former P'yŏng'an Province, remained a province of Korea until 1945, then became a province of North Korea. 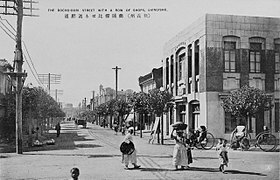 Its capital is Sinŭiju. 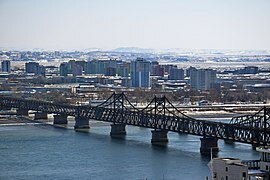 In 2002, Sinŭiju Special Administrative Region—near the city of Sinuiju—was established as a separately governed Special Administrative Region. The Yalu River forms the northern border with China's Liaoning province. The province is also bordered on the east by Chagang Province and on the south by South Pyong'an Province. The Sinŭiju Special Administrative Region is located in the western corner of the province, and was created as an administrative entity separate from North Pyongan in 2002. North Pyongan is bounded by water on the west with Korea Bay and the Yellow Sea. North Pyongan is divided into 3 cities ("Si") and 22 counties ("Kun"). All parenthetical entries given in Chosŏn'gŭl / Hancha format. 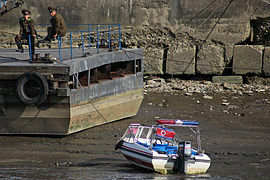 ^ "Yeng-byen, North Pyongan Province, North Korea". www.mindat.org. Retrieved 2017-10-01.